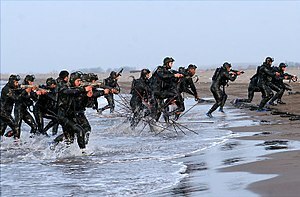 Apart from the phrase of Islamic Revolutionary Guard Corps, the Iranian Government, media, and those who identify with the organization generally use Sepāh-e Pâsdârân (Army of the Guardians), although it is not uncommon to hear Pâsdârân-e Enghelâb (پاسداران انقلاب) (Guardians of the Revolution), or simply Pâsdârân (پاسداران) (Guardians) as well. It should be noted though that among the Iranian population, and especially among diaspora Iranians, using the word Pasdaran normally indicates admiration for the organization. Major General Qassem Suleimani (Quds Force) General Suleimani was responsible for negotiating several accords between Iraqi political figures. ^ a b "Iran: New chief appointed for secretive military unit". Iranfocus.com. 1 March 2006. Archived from the original on 10 January 2008. Retrieved 25 December 2011.